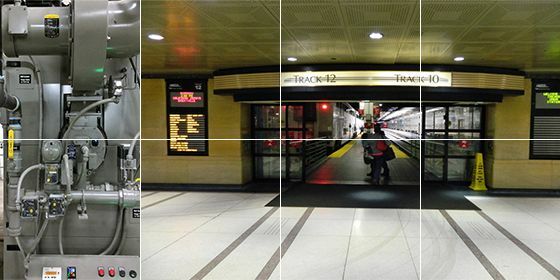 Chicago Union Station is a major transportation hub serving more than 130,000 commuters and long-distance train passengers daily, via Amtrak and regional carrier Metra. In this $2.4 million improvement project, G/BA worked with Amtrak (owner), CBRE (facility manager), and architect Wiss Janney Elstner to analyze and remediate air infiltration problems in the building. Work included air systems troubleshooting and subsequent design for MEP upgrades. G/BA and its architectural partner analyzed causes of air filtration, especially through track gates during winter, which was causing user discomfort as well as freezing issues. Several options for mitigating infiltration and fixing thermal conditions were explored. Airflow testing proved that the building was at a large negative pressure from mechanical systems operations alone. Calculated stack and wind effect were also contributing to air infiltration during winter. The team worked with facility manager CBRE to vet through the options and develop a budget. The design phase was authorized in summer 2015, and implementation began in the winter of 2015-16. To expedite construction, G/BA worked with CBRE to pre-purchase long-lead items. In addition to extensive exterior and track door upgrades, G/BA proposed the introduction of additional outside air through the building’s air handling systems to minimize mechanical systems imbalance. Heating capacity was added to the station’s central plant via a new 4,000-MBH condensing hot water boiler. Heating distribution close to track doors was improved with hot water terminal units. All track doors and associated air curtains were replaced and commissioned for reliable operations as part of the project. Operational adjustments were made to reduce door openings at certain times during cold weather. New DDC controls were provided to control and monitor temperature and equipment operations at the tracks. The project was bid to multiple contractors; G/BA assisted in scope reviews and the construction contract award. We worked closely with CBRE and contractors to ensure that the schedule was met, and coordinated with owner Amtrak to accommodate current and future priorities.